Bacon has been the popular item on foodie lists these days. Chocolate Covered Bacon, Bacon Ice Cream, Bacon Pancakes, the list goes on. Although I could get on board with chocolate and bacon (salty and sweet, yes!) I prefer the more traditional use of bacon. 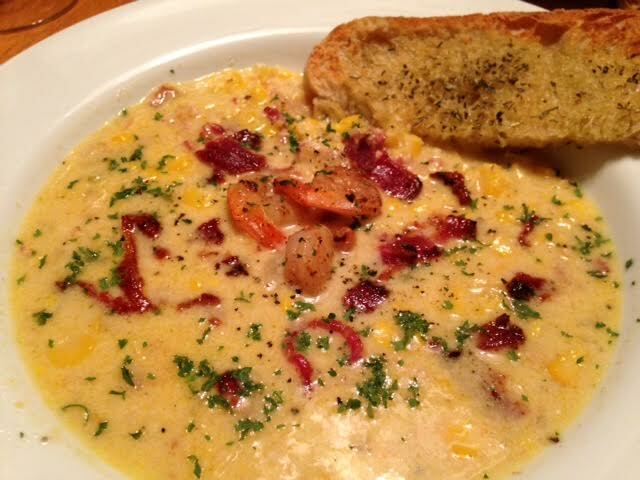 How does Bacon Shrimp Corn Chowder sound? It is soup season. Let’s talk. Here’s a fun fact. The first soup ever made was hippopotamus soup. Apparently that was the soup of the day (get it?) back in 6000 BC. Hippo Soup. Really. Just for grins, I googled Hippo Soup. Although Hippopatamus Soup did come up, cute little hippos made out of croissants used as a side with a vegetable based soup sounds a little more appealing to me. Now that you know a little trivia, let’s get back to this wonderful non-hippo recipe. I was inspired by a recipe I found on Pinterest. Don’t you just love making a recipe your own by adding your own touch to it? Even if it’s one little ingredient or spice, it’s now YOUR recipe. To make this recipe my own, I kicked it up a notch – to borrow a phrase from one of my favorite chefs (Emeril) – by adding red pepper flakes and using smoked bacon. I mean, what else could you want in a soup? Shrimp, sweet corn, smoky bacon and a pop of spice from the red pepper. Believe me, your family will go crazy for this yummy Fall dish. A quick and easy chowder featuring smoky bacon, shrimp and corn. In a pot, cook your bacon until brown and crispy. Remove and set aside. Throw in the shrimp and toss around in the bacon fat. YUM! Remove and set aside. Add celery, onion and garlic, let simmer for about 3 minutes. Add the corn and all the spices. Simmer another 3 minutes. Add in your liquids- chicken broth and half and half. Then add your bacon. Save a little for garnish. Let the soup simmer for a good 5 minutes. You will need a blender for the next step. Pour half of the soup in a blender and puree until smooth. Be careful, be sure to put a towel over the top while pureeing. Add the puree back into the soup, add your shrimp. Be sure to save some for garnish. Simmer for another 5 minutes. Pour the soup in a bowl, garnish with bacon, a couple pieces of shrimp and some parsley. I am a Wife of a Realtor, Mom of three girls and Author of Cooking Wright with Donna.A Foodie who loves a good glass of wine and enjoys entertaining.Step into my kitchen and I will show you some great dishes. I am a Wife of a Realtor, Mom of three girls and Author of Cooking Wright with Donna. A Foodie who loves a good glass of wine and enjoys entertaining. Step into my kitchen and I will show you some great dishes.